view another article... This foot condition is the new back pain — it’s everywhereCarestream, CurveBeam to spread word about weight-bearing CTNew Cartiva ImplantPain Free Plantar FasciitisUFAI featured on ABC NewsCarolina Panthers Star Lotulelei's Foot InjuryFoot Surgery InnovationsBiggest Opportunities for Foot SurgeonsDoctors TV Show - Foot Surgery while Pregnant10 Diseases Your Feet Can Reveal, Readers DigestPlantar Fasciitis TreatmentsThe Doctors TV, Living with Plantar FaciatiisHow to Stop Foot Pain for Good44 Ways to Correct Hallux ValgusDo fat-soled running shoes protect aging joints?Ankle replacement can restore mobilityCam Newton's Ankle InjuryMinimally invasive Foot & Ankle Surgery49ers' Crabtree 'amazing' Achilles recoveryAbout Kobe Bryant's Knee InjuryCurry more likely to play than BryantAlbert Pujols' Foot InjuryWill Kobe Return? Doctors Raise Questions About Laker Star's Future In The NBAWhat Kobe must do to prove 'doubters' wrongKobe Bryant's difficult task ahead after injuryPau Gasol's return from foot injuryIs barefoot running a bad fad, or better choice?Born to Run Barefoot?Born to run barefoot? Some end up getting injuredCan a $15 basketball shoe have game? In order to show that a person has a problem with heels, you do a pressure distribution study, Baravarian said the scanner shows if there is damage to a patient’s foot, but it does not show the amount of stress going into that particular area of the foot. 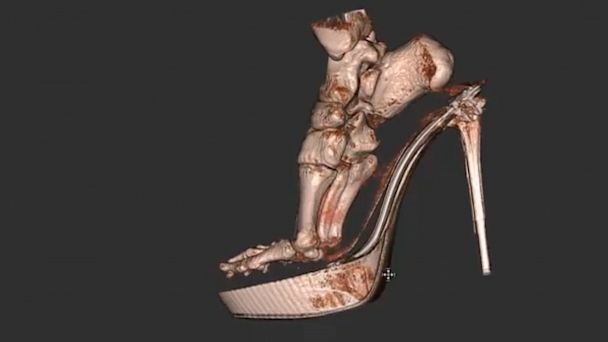 This 3-D scan of a female foot in a high-heeled shoe might make you rethink that new pair of Manolo Blahniks. For the first time in the United Kingdom, specialists at Royal National Orthopaedic Hospital in North London, England, are using new technology to view the foot and ankle in 3-D. They hope the PedCAT 3-D scanner will transform the treatment of foot and ankle problems often caused by wearing high heels. “The new scanner allows us to clearly see how the foot and ankle looks and functions inside shoes fully weight bearing,” Andy Goldberg, a consultant orthopedic surgeon at the hospital, said in a news release. Patients can stand in the scanner wearing their shoes or barefoot while hundreds of 2-D X-rays are taken of their feet. The images are then combined to create a 3-D image from every angle in just 60 seconds. While there is an established connection between high heels and foot pain, this is the first time the effect of shoes on feet can be seen in real time. With the help of the scanner, specialists at the hospital were able to see that wearing a high heeled shoe can force a foot into an unnatural shape, which can cause pain and long-term damage after frequent use of heels. However, other experts may argue that the 3-D scanner is not an entirely adequate tool in diagnosing and treating foot pain. “In order to show that a person has a problem with heels, you do a pressure distribution study,” Dr. Bob Baravarian, chief of podiatry at Santa Monica/UCLA Medical Center, told ABC News. Baravarian said the scanner shows if there is damage to a patient’s foot, but it does not show the amount of stress going into that particular area of the foot. “It could be from a previous injury or it could be from high heels,” Baravarian said. Nonetheless, both Baravarian and Goldberg agreed that a ban on high heels is not ideal. To avoid major foot pain and damage in the future, he and Goldberg suggested wearing heels in moderation. “You think we can ever stop women from wearing high heels?” Baravarian asked.